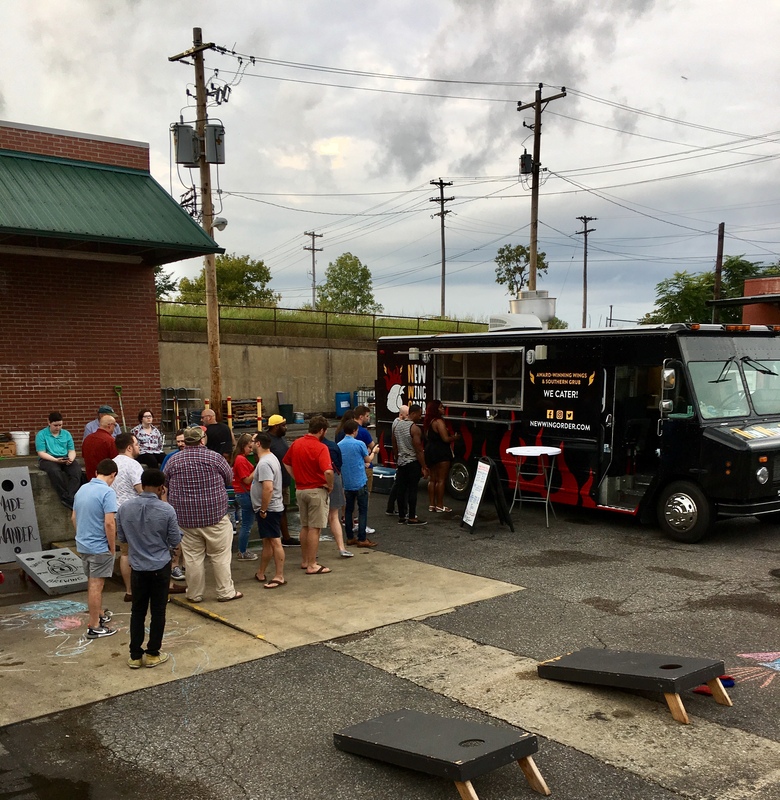 Yesterday, with the aid of an umbrella, I walked down to the Ghost River taproom for the Downtown debut of the New Wing Order food truck. New Wing Order is a multi-time championship team from Southern Hot Wing Fest, and they decided to turn their winning ways into a business. Of course, there are kinks to be worked out with any new restaurant, including food trucks. When I got there at 4, they weren’t serving yet because they were having problems with their generator. I got a Ghost River Grindhouse cream ale – which I was happy to find was on a $4 special – and waited it out. About 5:30 they got everything running and opened for business. A long line developed within minutes. I had been watching from the patio and got down there right after they opened, so I avoided the line. Because I had their signature flavors during the tasting I attended back in March, I decided to try other things on the menu. However, if you’re a wing fan I would encourage you to start with the signature flavors. The Memphis Buffalo sauce is what won them their Southern Hot Wing Fest championship, combining heat and a nod to Memphis’ BBQ tradition. I inquired about the Inferno wings and was told, “they’re so hot, I can only eat 2 or 3 of them.” I decided not to take the chance. I ordered 6 wings with the Buffalo Hot Sauce. My BBQ team pitmaster Kris made me a big fan of Alabama White BBQ sauce earlier in the year, so I ordered six of those as well. The fries were available as classic fries, Cajun fries, or garlic parmesan fries. I got the garlic parmesan. One thing to note: These are breaded wings, unlike many wing restaurants that serve them naked. Very good though. The hot sauce was not too hot, making me wonder if I should reconsider the Inferno wings next time I visited the food truck. Love that Alabama white sauce. The garlic parmesan fries were a hit too. 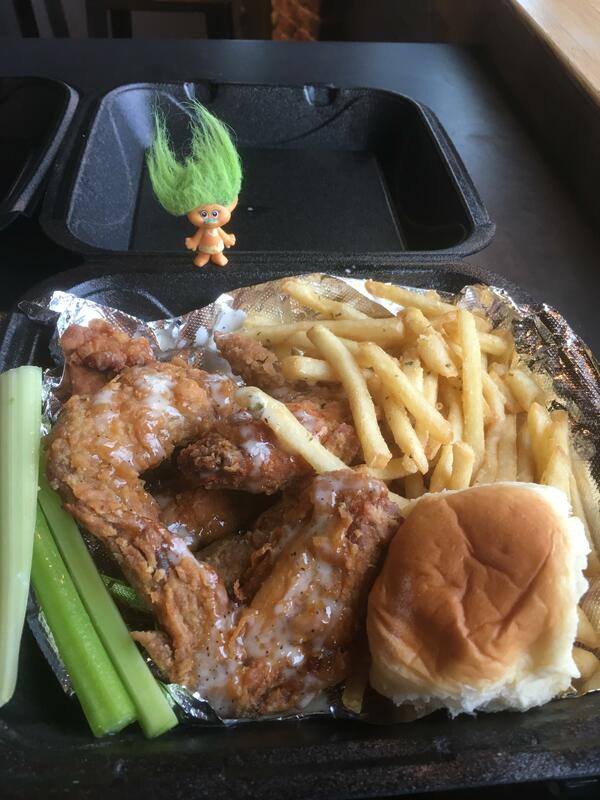 You get celery with each wing order, which my troll liked because it’s the same color as her hair. 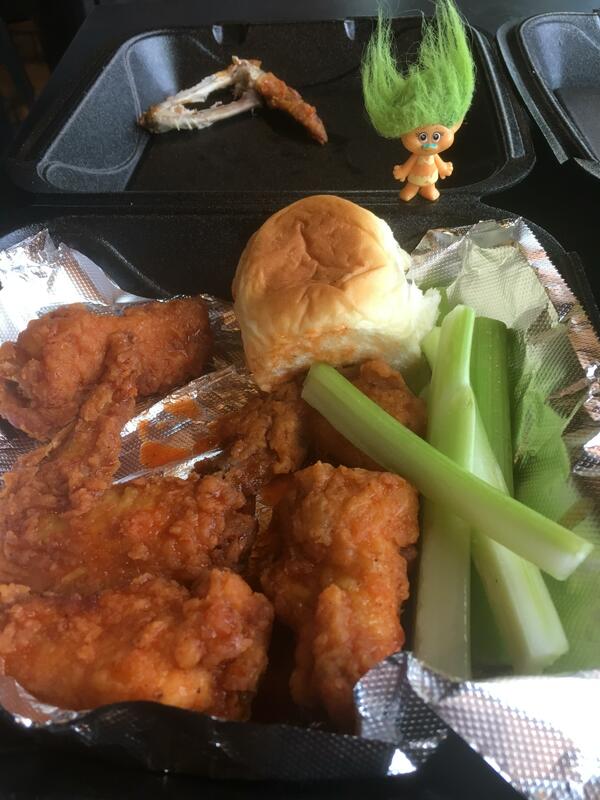 You can request ranch, blue cheese, or jalapeno ranch dipping sauce. For my vegetarian and vegan readers, New Wing Order has an avocado taco that I got to try at the tasting in March and it is yummy. I started the day with a walk to the Farmers Market about 10 in the morning. The forecast said there might be a little rain later in the day, so I took the umbrella, thinking how stupid I must look carrying it around in the sunshine. I wasn’t looking stupid on the walk back from Ghost River, though. Almost as soon as I stepped onto the sidewalk on Main Street, it started pouring. Although my hair stayed dry, the wind was blowing rain onto my shorts and sandals, and I decided that a walk all the way back to the core was not a good idea. So I stopped off at my home away from home on the south side, Max’s Sports Bar, to wait out the rain. I got a seat at one of the tables against the back wall facing the bar. The line at the bar was 2-3 deep, and it was unavoidable that people trying to get down the center aisle would brush up against me. Anyplace else, I would have been incredibly annoyed. But at Max’s, it’s just part of being there. We’re all friends there and we’re all there to watch sports. Also, I have to give compliments to Mike the bartender. No matter how busy it was at the bar, no matter how many people were clamoring for his attention, he always knew when I was down to about 3 sips left of my beer, and asked me, “Another one, Paul?” I appreciate the way Mike, and really all of the staff at Max’s, take such good care of the regulars. The Memphis loss to Navy was disappointing. It’s going to be tough for Memphis to get into a position to be the Group of Five representative in a Big Six bowl now. I couldn’t dwell on the Memphis loss for long, though, because I had Arkansas to watch. They played the Colorado State Rams starting at 6:30. My friend Krisma, a fellow Hogs fan, came in and we watched the game together. It turned out to be the second disappointment of the night, with Colorado State coming from way behind to beat Arkansas 34-27. “I was hoping we wouldn’t be the doormat of the SEC this year,” she said. “Yeah, looks like we’re the Tennessee Vols of the SEC West,” I replied. Despite the bad day for my teams, it was a reminder how much fun College Football Saturday at Max’s is. I will be back soon! Last night’s Pacific Coast League playoff game at AutoZone Park was postponed due to bad weather. Game 4 of Memphis vs. Oklahoma City will be played at 2:05 today as a 7-inning game. If necessary, Game 5 will start 30 minutes after the end of Game 4.